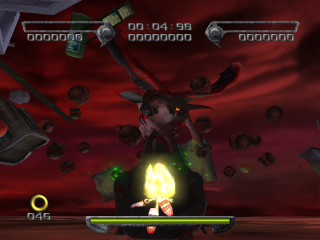 Devil Doom is the final boss of Shadow the Hedgehog, fought after The Last Way in the game's last story. Black Doom has teleported the Black Comet down to the surface of Sonic's world using a 7-Emerald Chaos Control, and the Black Arms look poised to conquer the entire planet. With most of the other heroes paralysed by nerve gas, Shadow is galvanised into action by a message from Gerald and Maria Robotnik, revealing that the Professor intended the Eclipse Cannon be used to annihalate the Black Comet. Black Doom warps to the outside of the comet as the demonic, two-headed Devil Doom; Shadow pursues as Super Shadow. Exactly what Devil Doom is never gets explicitly addressed; it may be a super transformation of Black Doom, or a giant Black Arms which Doom controls directly through Doom's Eye. Super Shadow can fly, but you can only stay Super Shadow as long as you have rings. The moment your ring count drops to zero, you revert to normal and will plummet to your death. Never let your ring count drop below zero. You get more rings by blasting the balloons that among the debris that surrounds Devil Doom while you're still far away. If your ring count drops below 50, move close to him so he'll warp away and summon a new bunch of debris. The Jump button will allow you to get a speed boost. Use this to get close to him when you're far, and also to move in for the kill. The Attack button will fire off Chaos Arrows. Use it to smash debris. Holding down the Attack button until Shadow says "Chaos", then releasing it, will fire off Chaos Spear. This attack does the most significant damage to Devil Doom. Destroying debris will fill up the Dark meter, while destroying meteors will fill up the Hero meter. Shadow's Chaos Powers from both alignments are accessible. Shadow retains his ability to strafe (the Chaos Spear functions as a handgun). Simply hold the right trigger while shooting. City Debris: When you're far away, Devil Doom summons a bunch of debris from the destroyed city below, and tosses them at you. Fire your Chaos Arrows at them to destroy them before they hit you. Meteor Laser: Meteors surround Devil Doom, which move around in different patterns, firing lasers at you. If you keep moving, none of them should hit you. You can also destroy the meteors. Fire Breath: When one of Devil Doom's heads is facing you, it will exhale and blast fire at you. Move sideways to avoid. Chaos Control: When you're too close for too long, Devil Doom will disappear, and reappear somewhere far away. He is likely to do this after you hit him as well. The boss' only weak point is Doom's Eye. It switches between the two heads, each time you hit it. You can't miss it, one of the heads seems to have no eye, when the other one does. If the head you're looking at doesn't have it, move around it to the other one. The most effective way to damage it is to hit it square in the eye with a fully charged Chaos Spear. However, Chaos Spear takes a while to charge up, and being too close for too long will make him move away. So stay well outside his meteor field while charging up, then quickly boost inside with the jump button, and release Chaos Spear when you're close. He'll probably use Chaos Control right after it. As for Shadow's own Chaos Control and Chaos Blast, the time-freeze Chaos Control can often mess up your aim, so use with caution. Chaos Blast deals only little damage to the eye, but it can be useful for taking out a large chunk of debris or meteors. This page was last edited on 31 October 2017, at 18:26.